The meaning of a chauffeur is a person who drives a transport vehicle as their occupation. Chauffeurs are more commonly used by the rich and famous. Chauffeurs are normally seen driving vehicles such as Bentley’s, Rolls Royce, Mercedes Benz, BMW, and these are just saloon vehicles, you will also see chauffeur drivers driving different types of stretched limos such as the standard stretch Lincolns, Hummer limo hire, Range Rovers, Porsche Cayenne limos, Ford Excursions, Lincoln Navigators, Fire Engine limousines, Chrysler C300 Baby Bentley limos and even the new Audi Q7 limousine. All these vehicles can come in many different colours such as Black, White, Silver, Pink and in certain areas we even have gold and orange. The chauffeur stretch limo driver experience is amazing, you can be treated like royalty and enjoy the pleasure of relaxing in a limo with a glass of bubbly and listening to your favourite music whilst being driven around town and remember the benefits of this limousine is that you don’t have to think where are you going to park or whether you will have to walk far to get to the venue. Also we will pick you up on your return with a refill of the bar, so you can once again relax with a glass of bubbly. 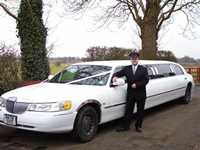 All our limousine chauffeur drivers are polite, friendly, and can have a laugh. The limousine drivers will also show how to use all the gadgets in the limo, including lights, and music. We also have access to different fire engine limos with the crew fully dressed in fireman outfits who will give the ladies fireman lifts and trust me ladies this is a must! Please give us a call on 0871 789 9911 if you want to have some fun in our limousines.